FACT: There’s a real-life parasite currently infecting half of the world’s human population and three quarters of the animal population. Once infected, this parasite rewires its host’s brain for excessive aggression and complete disregard for its own self. Most of its hosts have no idea nor show any symptoms, as it lies dormant, waiting for the right time to be awakened, where it will unleash its host animal’s aggressive violence on everything and any one around it. 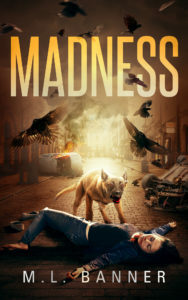 The MADNESS Chronicles is the thrilling new apocalyptic-horror series created by international best-selling author, ML Banner. The Madness World (in which the series is set) opens up with a trilogy, the first two books (MADNESS & PARASITIC) were just released and the third (INFECTED) is scheduled for release in September. Get ready for the new word in horror… MADNESS. Check out the complete series, exclusively on Amazon.